LOS ANGELES — On Friday January 14, 2011 Western Watersheds Project filed suit in federal court to halt construction of the Ivanpah solar power plant project being built in the Mojave Desert on public lands in eastern California near the Nevada border. The project site consists of 5.4 square miles of high quality habitat for the threatened desert tortoise. Threatened by habitat loss, habitat degradation, disease, and predation by ravens and coyotes, the Mojave population of the desert tortoise was listed as threatened under the Endangered Species Act in 1990. Since then, populations have continued to decline. The Ivanpah Valley is home to the most genetically distinct of the five recognized California desert tortoise populations. Desert tortoises on the Ivanpah power plant site are one of the highest elevation breeding populations known, and the area provides essential habitat connectivity through the mountain passes to desert tortoise populations in the neighboring valleys. “The environmental review for this project was rushed and inadequate – the agencies did not even determine how many desert tortoises were on the site, nor did they determine what impact blocking the north Ivanpah Valley with an industrial-scale power plant would have on connectivity with other tortoise populations,” said Connor. 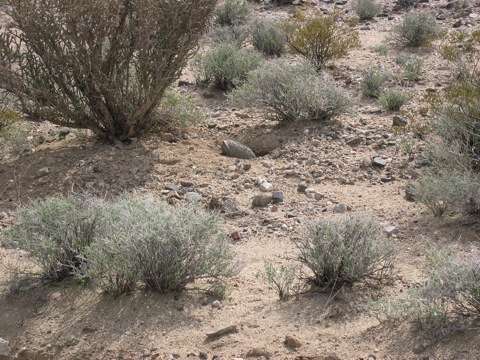 The site located in relatively undisturbed Mojave Desert near Mojave National Preserve, is prime habitat for 19 other rare animal species including desert bighorn sheep, golden eagles and burrowing owls, and several rare plants in addition to desert tortoise. There are impressive stands of barrel cactus, and centuries-old Mojave yucca. “The federal government’s rush to approve this ecologically disastrous project is a textbook example of how NOT to address our energy needs,” said Western Watershed Project’s attorney Stephan Volker. “Virtually every significant environmental law was shortcut to shoehorn this destructive project into this ecologically irreplaceable site, despite the known availability of cheaper and better power sources including conservation, roof-top solar, and energy development in existing industrial zones,” added Mr. Volker. The 1.7 billion dollar power plant project is being underwritten with $1.3 billion in federal loan guarantees and “economic stimulus” funds. Secretary of the Interior Salazar approved the project in October. Western Watersheds Project’s mission is to protect and restore watersheds and wildlife on public lands throughout the American west through education, research, public policy initiatives and litigation. Western Watersheds Project has offices in six western states including California. By Nichola Groom – Reuters. I still have not heard or read of a single instance where a coal-fired power plant has been shutdown because its output was replaced, in whole or in part, by electricity from a solar plant or wind farm. And there are some mighty big wind farms within 20 miles of where I sit, all built by dozing new roads and fragmenting forest-interior habitat. Go WWP!! Stop this project dead in it’s tracks! There are other alternatives to placing solar farms in wildlife habitat. They need to be forced to identify alternatives sites for solar energy generation…hey like rooftops in LA? Hmmmm…does anybody smell a little “arbitrary and capricious” in the air??? My wife and I continue to wonder exactly WHAT the Ivanpah project is. On reflection (no pun intended), it would seem to be an enormous sidewalk in the desert on which we fry our eggs (like we did when we were kids). The “technology” is nothing but using the sun to heat an emorous teapot, as it were. When the teapot boils, we get steam to power turbines. All it takes is 3,600 acres of desert to make the teapot (er, sidewalk). If this is what Interior Secretary Ken Salazar calls “green” energy–50,000 acres of desert for giant teapots–he belongs in the James Watt Hall of Fame. Our public lands were never meant to underwrite a gold rush of simplistic schemes. These teapots will solve nothing but, yes, the desert will be destroyed. How about the solar power we were promised by all those smart people in Silicon Valley–localized, innovative, easily installed, and cheap to own? Ah, but there is the rub. The homeowner would indeed control it. We can’t have that now, can we? Solar power has to be big, expensive, and destructive and make campaign contributors into billionaires. It has to be a teapot covering thousands of acres of our dwindling public lands. The simple reminder of history goes like this. “If it is ugly, it isn’t green.” Good for WWP. Now, where is the Sierra Club on this issue–and Audubon–and everyone else who loves the desert? Does the Sierra Club really want us to believe in teapots? In that case, David Brower will be rolling in his grave. Once upon a time 50 years ago, the Grand Canyon was to be the teapot. David Brower stopped it cold. We don’t make leaders like that anymore, do we? All we do is paint the teapot green. I still have not read (or heard of) about a coal-fired power plant being shut down because its output was replaced by solar- or wind-generated electricity. I sense good advertising copy when it comes to such “alternative” energy sources, but that’s all. I am usually pretty hard on the right but solar and wind power are crazy left-wing politics at work supported by love your mother nature goddess crowd. Neither solar or wind make sense for several reasons and are largely a waste of money and degrade the landscape and wildlife habitat. I advocate thorium cycle reactors. It do not understand why the US is draging their feet on thorium cycle reactors. India, Russia, and China are all moving ahead with thorium cycle reactors. PW – with thorium, are we not looking at the same kind of situation that has come from reaping the benefits of fossil fuels? The mining. the processing AND what to do with the waste (a dangerous waste) and wasted landscapes? Despite the thorium fuel cycle having a number of attractive features, development even on the scale of India’s has always run into difficulties. • reduced radioactive wastes generally. • the technical problems (not yet satisfactorily solved) in reprocessing solid fuels. Much development work is still required before the thorium fuel cycle can be commercialized, and the effort required seems unlikely while (or where) abundant uranium is available. In this respect international moves to bring India into the ambit of international trade are critical. If India has ready access to traded uranium and conventional reactor designs, it may not persist with the thorium cycle.